Are you ready for a new ELK game that’s super fun and interesting? ELK just launched Joker Gems, a 5×5 grid with clusters instead of ways to win. The game brings together classic slot symbols with a modern twist as well as exceptional graphics. The best part about the game is the fact that you can win up to €120.000! There are three jackpots in play one that’s worth €10.000, one of €20.000 and one of €50.000. in order to land them you need to fill some areas with identical symbols. For the biggest one you need the entire reel set covered in the same icon. 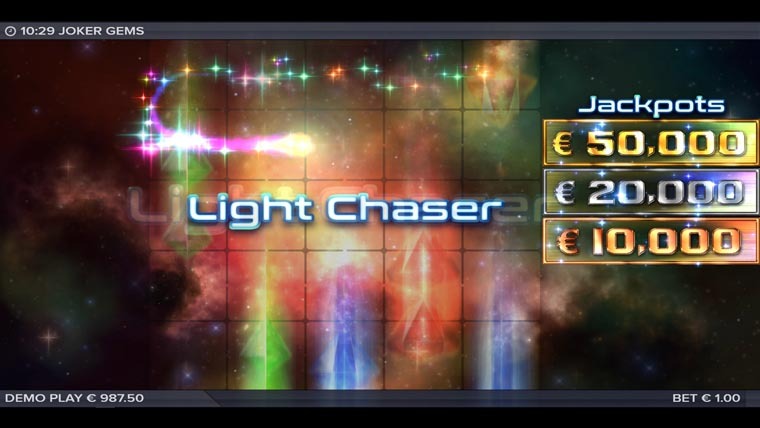 There’s also a bonus feature that can help you out: the Light Chaser. It can randomly appear between spins and create a cluster of four to five identical symbols thus resulting in a win. Why play it: The game is really fun and like all ELK slots it has really nicely flowing gameplay. Joker Gems doesn’t have as many bonus features as we’re used to when talking about ELK, but this doesn’t take anything away from it.